As you can see, they were externally but not internallly fireproof. In 1842, according to Giles and Hawkins, there were 142 warehouse fires, at least one of which destroyed 9 warehouses. (This one, signed up top as "1874 Metcalf's," only burned a few years ago but is now internally a void spanned by a few charred timbers.) 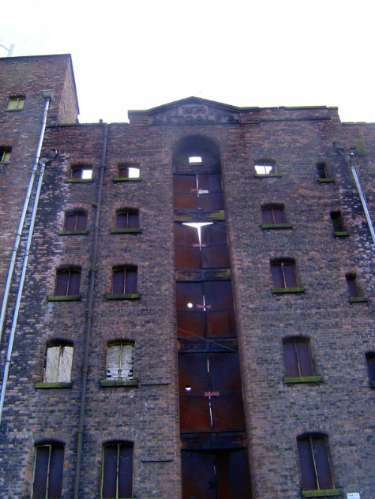 The Liverpool Warehouse Act of 1843 was the inadequate response: it stipulated that new warehouses had to be registered and built with fireproof exterior walls. The insides could be wood, but the owners of such buildings paid higher insurance premiums. You can see the loading doors as well as the windows, which gave some light to the storage areas, and the small windows on the right, which lit the narrow staircase. Perhaps these buildings were crude, but they accommodated most of the growth of the port of Liverpool. It came with a rush. Tobacco imports, for example, were nothing in 1665 but 1.75 million pounds in 1700 and 6.1 million pounds in 1750. Sugar imports rose from 70,000 pounds in 1685 to 1,160,000 pounds in 1700 and 10,000,000 pounds in 1750. The Albert Dock was still a century in the future.